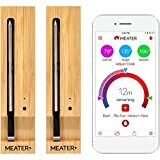 We’ve covered the MEATER True Wireless Smart Meat Thermometer several times here at BGR Deals, and readers have loved it each and every time. In fact, thousands of you have jumped at the opportunity to get this awesome accessory that pretty much makes it impossible to mess up meats. Simply stick it in your steak, chicken, or anything else and pop it in the oven, pan, or on the grill. 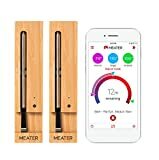 The thermometer connects wirelessly to your phone and notifies you the instant your meat reaches the exact internal temperature you want! The MEATER is a bargain at its normal price of $69, and the longer-range MEATER+ is a great deal at $99. But for Black Friday, both models have been discounted for the first time ever on Amazon. From today through the end of Cyber Week next week, you’ll save 15% on a MEATER 2-Unit Bundle or on a MEATER+ 2-Unit Bundle. Keep one for yourself and give one as a gift — trust us, this is the best possible gift you can give anyone who cooks! ► 100% Wire-Free: No wires. No fuss. The first truly wireless smart meat thermometer. Monitor your cook using the FREE app available for iOS / Android smart phones and tablets.